Welcome friends of Sir Gordon. And for those of you who haven't become friends yet, just sign up to Gordon'sBUGLE at the bottom of this page and we will welcome you like a long lost friend with open arms. But why should you become a friend of Sir Gordon I hear you ask? Well, we believe that life is much better with friends. Some brands build a community but we want to build a family. A family of friends. The brands we hold are already part of that family. And we'd like you to be part of it too. Being part of a family can have many benefits and we will endeavour to create as many benefits as we can for becoming part of ours. For starters, you will be get free delivery on all of your orders which you can check out in our delivery section. 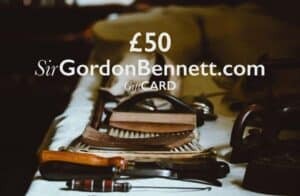 You will also have Gordon'sBUGLE sent to your inbox which is our newsletter/magazine that takes a look at British culture and history through the lens of design, manufacturing and brands. We will also be going inside some of the manufacturers workshops and interviewing the skilled makers that create the products we want in our lives. We will discover what drives them and find out why the ethos of look beautiful, made better, do the job they should and Made in Britain is so important to them and us. And Occasionally some interviews with Brits abroad on what they miss about these Sceptred Isles. Not only that, as we grow we want you to have access to stuff that those that are yet to become friends haven't got access to. That maybe special products, offers, events or anything else that we haven't thought of yet. To those that we can already call friends, thank you. And to those soon to be friends, we thank you too. Sir Gordon welcomes each and everyone of you into his online home and hopes to create a place where Great British design and manufacturing can flourish. Tally Ho!